You might remember a few months ago when my favorite blogger at Young House Love put out a call to her readers for a Pinterest challenge and I answered. Well, it’s that time again. Last week, Sherry announced round two of the Pinterest challenge and I was all too happy to get involved. On the surface, the challenge is quite simple – choose something you’ve pinned, try to recreate it putting your own spin on it, and share it with the world. I loved how warm this up-cycled project looked. 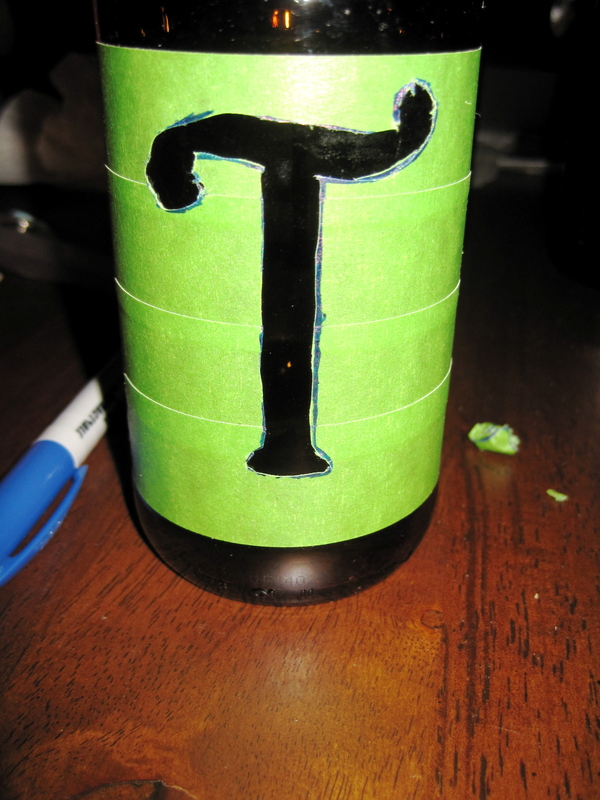 The original creator used recycled root beer bottles and vinyl letters (much easier than the route I took – see below) made on a Cricut machine. To see her detailed instructions, simply click on the photo above to be taken to the original post at choosetothrive.blogspot.com. The supplies I used were amber colored bottles, painters tape, acrylic paint, Hard Coat Mod Podge, a sponge paint brush, a crafter’s knife, and a selection of dried wheat and other flowers. The first items to gather were the bottles. Darrin was all too happy to play his part here. I was able to collect six Samuel Adams bottles, however, after Darrin brought home a pack of Sierra Nevada pale ale I decided that I liked the shape of the Sierra Nevada bottles better. 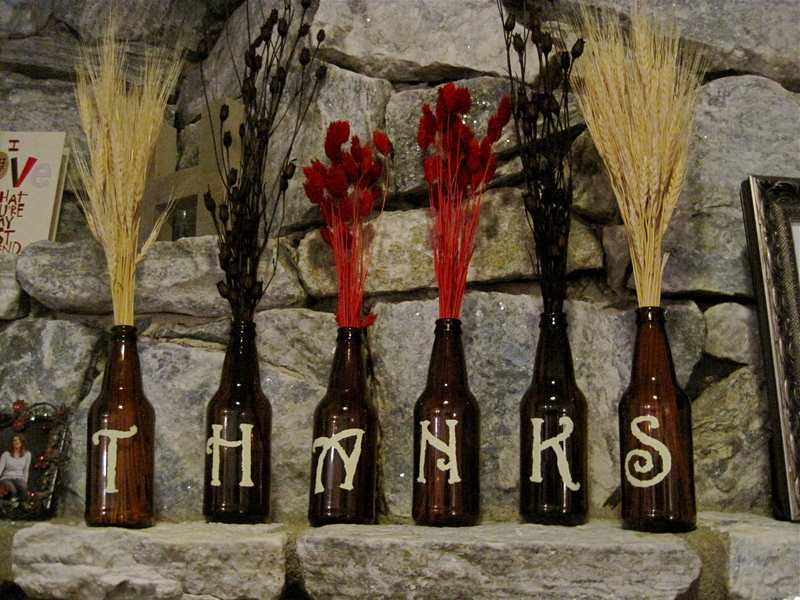 I saved the Sam Adams bottles for another Pinterest inspired project down the road. I found that removing the labels from bottles can be quite easy. I only had a couple bottles to clean at a time so I would let them soak in hot soapy water while I was doing dishes. By the time I was done washing all other dishes, the glue on the bottles was weakened to the point that I could easily peel off the labels. I then scrubbed any excess glue from the outside of the bottle, rinsed it, and left it to air dry. Some of my starting supplies: six clean bottles, a craft knife, painters tape, and letters. Notice the clean bottles. After collecting and cleaning my bottles, I needed to prepare my stencil. I do not own a Cricut machine so I needed to be able to paint on my letters. I first chose a font I liked (Harrington) and printed out my letters at my preferred height and width. Next, I cut out each letter. Then using painters tape, I taped off a section of the bottle, careful to make sure the area I taped was about the same height on each bottle. Preparing to trace the letter. The letter is ready to be cut. 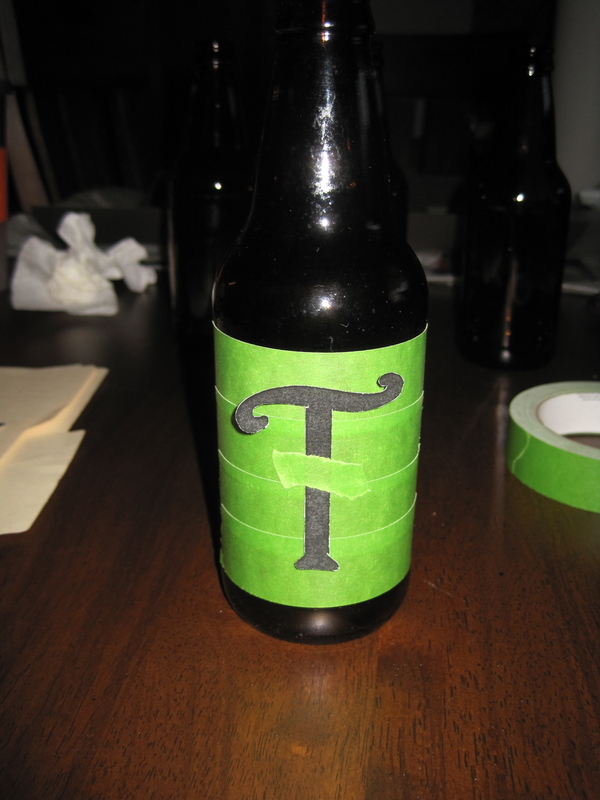 I then positioned one of the letters over the taped surface where I wanted it on the bottle; I secured the letter with two small pieces of painters tape (the painters tape worked well because I could reposition it as necessary). Using a thin marker, I outlined the letter. 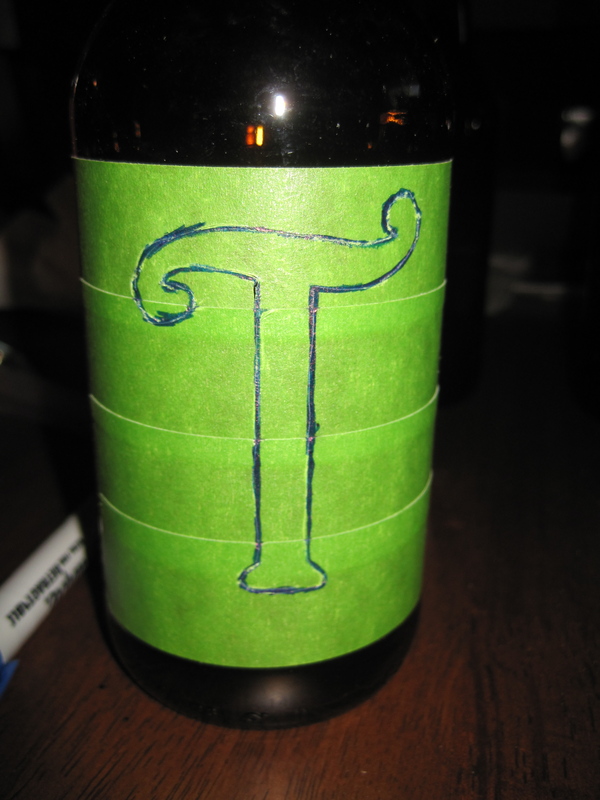 When the letter was outlined, I used a craft knife to cut out the letter from the tape on the bottle. What remained was a stencil of the letter on the bottle. I repeated each step on every bottle. 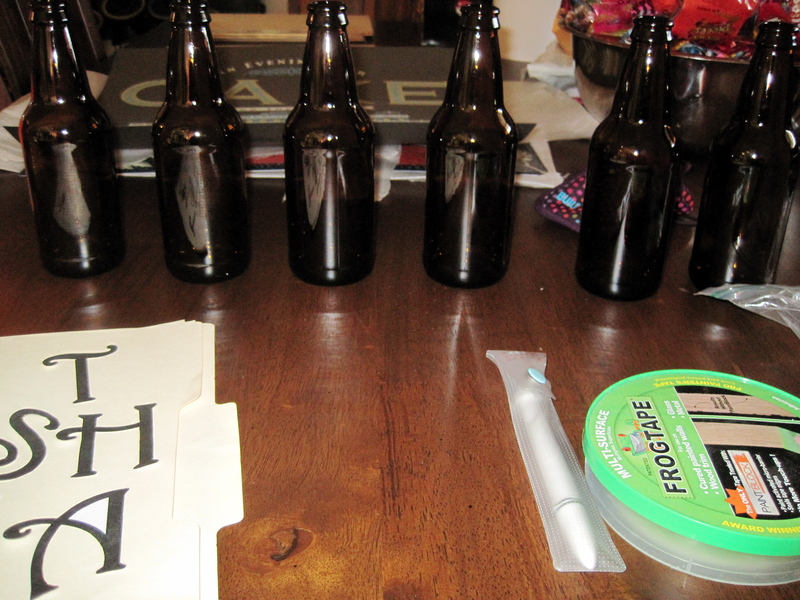 Once I had the stencils completed on all of the bottles I was ready to paint. I used acrylic paint and mixed a little yellow into white paint to create a light butter color. I was concerned that plain white might be too bright against the amber of the bottles. I then mixed in a little Hard Coat Mod Podge to ensure that the paint would stick to my surface over time. 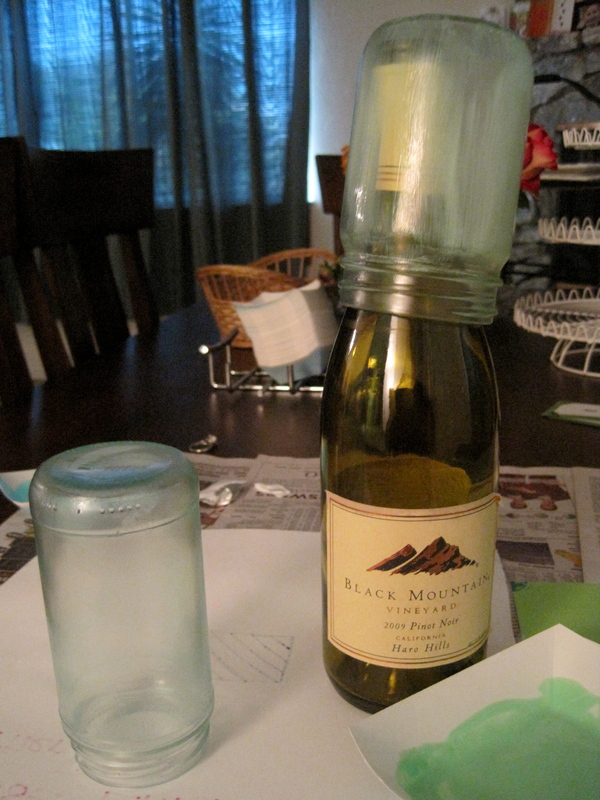 Next, I used a sponge brush to apply the paint to the bottles with a light tapping motion to give it an even coating. 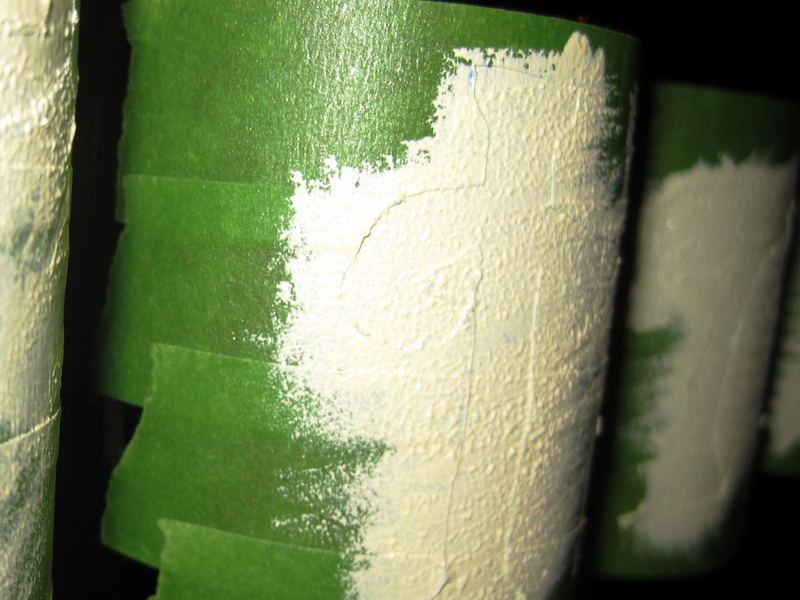 Here's a close-up of the texture of the paint on the bottle. After a few hours of drying, I very carefully removed the painters tape on the bottle. There were some areas where the paint on the bottle and the paint on the tape were stuck together. So, when I tried to pull the tape, the paint on the bottle tried to come off, too. Since the paint was still soft, I was able to place my finger on the paint on the bottle and pull the tape away. This worked to separate the paint and made sure that the paint left on the bottle would stick. The next day, all the paint on the bottle was secure and there was no sign of peeling. The paint dried nicely with a rustic like finish. The final step of this process was to add the floral decoration. The inspiration photo used stalks of wheat in each bottle. However, when I went to the craft store to buy the wheat, I was inspired by the different colors and shapes of dried flowers they had for sale. All I had to do was trim the stalks to my desired height before inserting into the bottle. The final product on our mantle. I’m so proud of how this turned out. I love the warmth this brings to our mantle, which is naturally cool in tones. I’m also thinking of bringing this decoration back out for our wedding next year, since it will be an early fall wedding. I can see this display on the sign-in table or somewhere where our guests can see it so they know we are thankful for their attendance and for sharing in the special day with us. As far as costs, the only thing I spent money on was the wheat and flowers. I bought them at Michaels and I used a coupon! 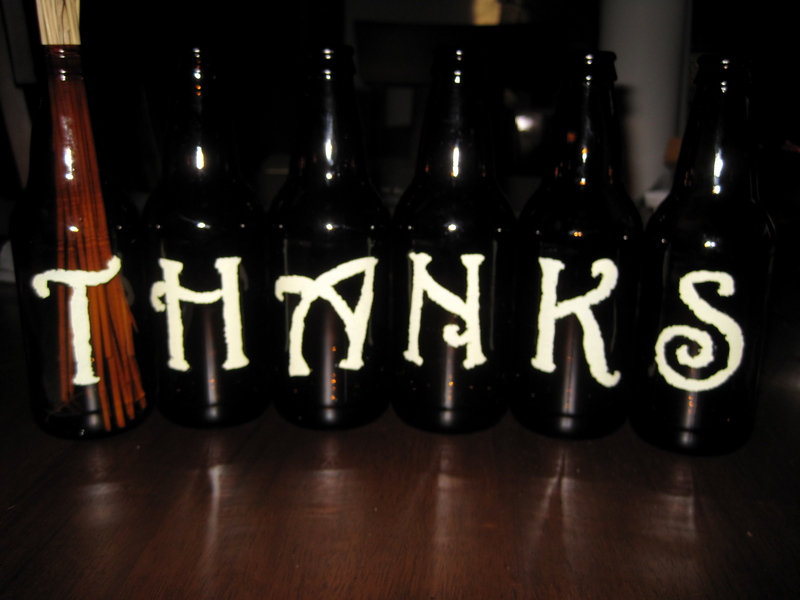 The bottles were recycled, I already had the paint, glue, craft tools, and painters tape. So, all in all, I’m also quite pleased with the cost of this project. If someone had access to wheat on their property, I’d think they could pull this project off for close to free. What do you think? Do you have any projects you’re working on that you’re particularly proud of? Share! Share! Also, be sure to check out what the pros produced during this round of the challenge. Visit Young House Love to see Sherry’s homemade Christmas ornaments. Go to Bower Power to check out Katie’s antiqued window project. Erin over at House of Earnest made a super cool gold lined lamp. Finally, super-builder Ana White built a pocket bookshelf for a little girl’s room. 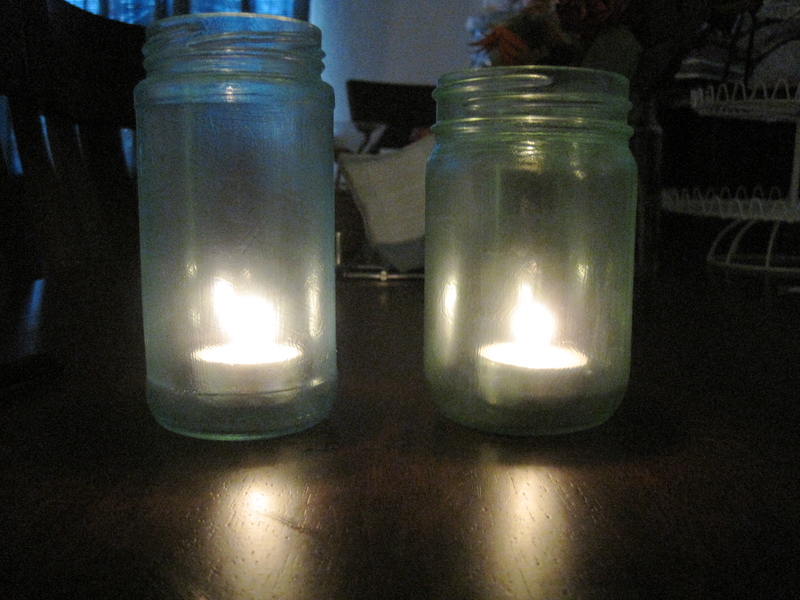 As stated in this post, I’m planning on incorporating jars and candles into our wedding reception decor. So, I’ve been saving jars from sauces, pickles, peppers – you name it. I can’t believe how many jars we are amassing in such a short amount of time! I’ve no doubt that by next October, we’ll have plenty of jars saved and I won’t have spend a single cent from our wedding budget to buy any. Suh-weet. In the mean time, I noticed more than a couple of great ideas on (you guessed it) Pinterest of things to do with these jars and I recently decided to give one a try. First, let’s take a look at the inspiration photo. 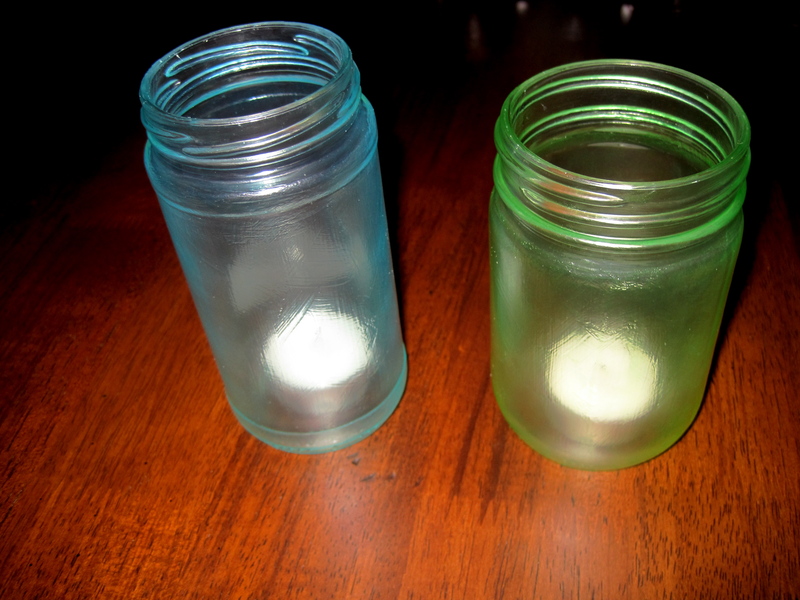 The crafty gal who created these adorable votives added a few drops of food coloring to Mod Podge, painted the concoction on the glass, et voila, pretty colored glass candle holders. I thought I would test this project out using the colors we want to use for our wedding – green and blue. Here’s a glimpse of my work-station set-up and supplies. I started with two clean jars, some paper trays (left-overs from our engagement party), a paint brush, green and blue gel food coloring, and hard coat Mod Podge. 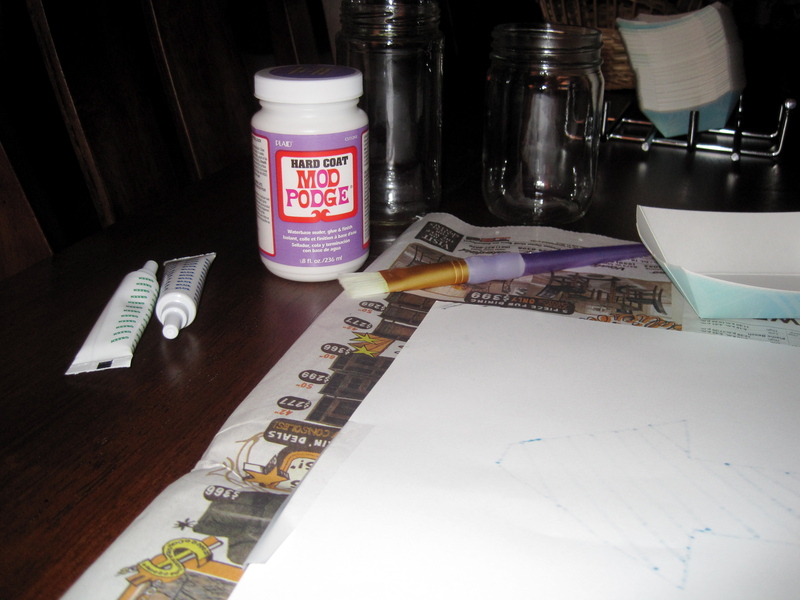 This was my first time working with Mod Podge and I have to admit I was a little intimidated when I was at the craft store and there were so many types to choose from. I decided to go with the “hard coat” because the bottle said it works on glass. But, maybe there’s another crafter out there who would have recommended another type. Oh wine...what can't you do? As recommended from the original source, I added a few drops of food coloring and mixed until I reached my desired color. At first, I held the jar upside down with one hand partially inside the top opening. However, overtime I found that things would get a little dicey as I had to paint nearer to the top of the jar. Enter my friend the wine bottle – the perfect stand. After a couple of coats, I noticed that the brush strokes looked streaky. So, I switched using an X or basket weave pattern. I think this would have been a good idea from the beginning. I think the jars look kinda cool, but I don’t think it’s something I would do for all the jars at the wedding. And here’s why – look at the photo below with the candles lit. The color really seems to disappear. The next time I get some fresh flowers, I will put them in these jars and see how that turns out. There might be a nice affect with water. 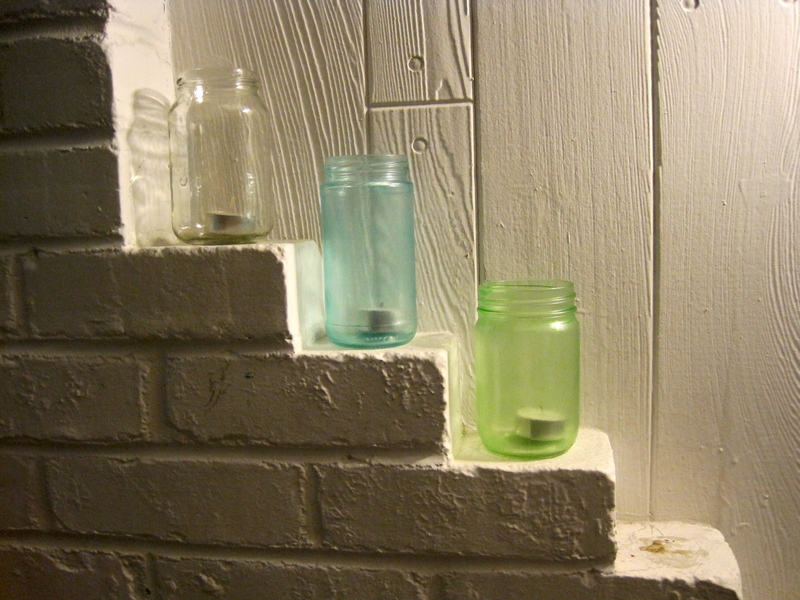 Right now, I have the jars placed against a white wall so the colors really pop, and it’s nice. So, what about you? Do you have any craft projects you’ve undertaken that didn’t turn out exactly as you hoped? What do you think about the jars? Would you give these a try?